SunFresh® Grains Natural Sun-grown Grains FREE of all animal proteins and fats for healthy, happy birds. High Quality Premium Mixed Grains To Encourage Natural Pecking and Feeding Instincts Top quality grains help reduce the incidence of birds pecking and harming each other. Certified Natural Your Assurance of Quality – It’s a Supplement You Can Trust Our guarantee that these are the very best grains providing a safe, natural supplement for poultry. 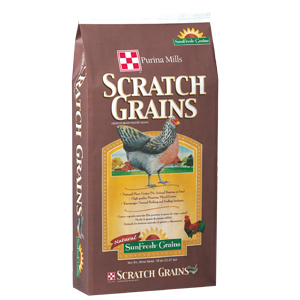 Important: Scratch Grains is a grain supplement, not a complete feed. If too much is fed, it will dilute the feed intake of complete feeds such as Purina Mills® Start & Grow® SunFresh® Recipe, Purina Mills® Flock Raiser® SunFresh® Recipe or Purina Mills® Layena® SunFresh® Recipe, reducing the bird’s nutritional intake and overall performance. A feeding program is only as effective as the management practices. Actual results can vary depending upon feed intake, environmental conditions and the quality of management practices.